Inspired by the iconic polo shirt, the signature Lacoste.12.12 Watch goes connected this season. Twisting the original brand codes, this smart watch is an ultimate combination of elegance and performance, created for modern urban life. 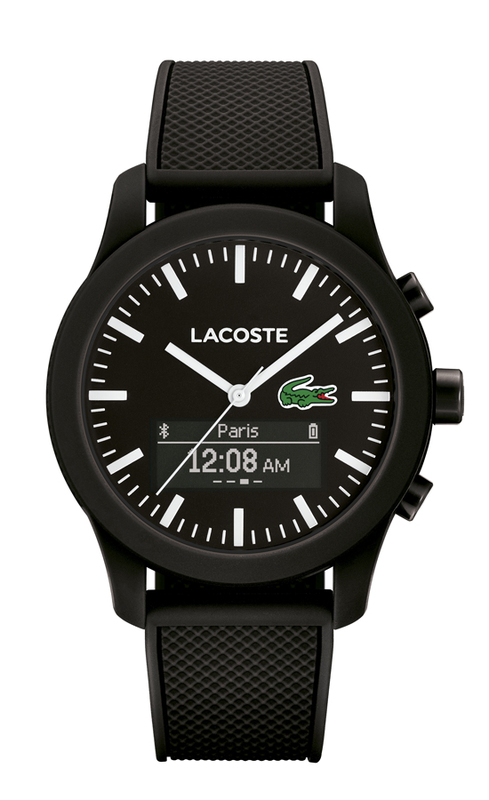 The Lacoste.12.12 Contact watch brings smart technology to an iconic design, keeping the wearer elegantly connected. A free Android or iOS app builds an invisible bridge between a true classic and a wearable communication cockpit. In the Lacoste.12.12 Contact, the brand spirit reaches new, yet never final, frontiers. INCOMING CALLS – A gentle haptic tap signals an incoming call, whilst the display shows you who it is. NOTIFICATIONS – Any notification pushed to your phone can be pushed to the watch. WORLD CLOCK – You can get set six global locations via the app. ACTIVITY TRACKING – Your watch accurately tracks every step you take.